This photo was taken on Saturday June 13, 2013 at 6:16 AM. The location was in a curb side planter on Capital Hill. The "Take It!" came as I stepped out of the car to take care of one of the routine stops we make in Capital Hill neighborhood. 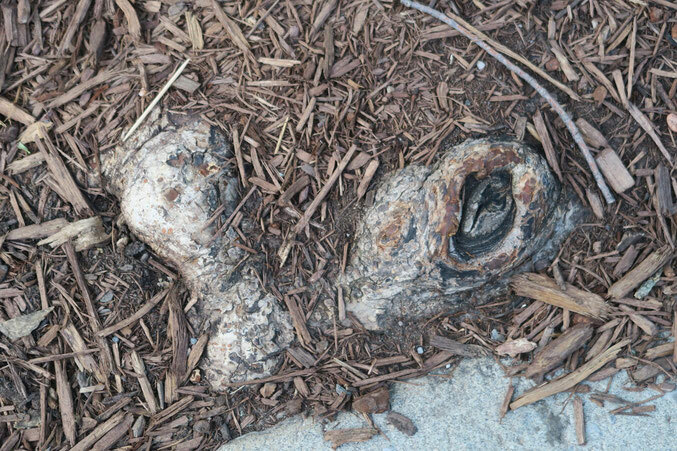 I had seen this root formation before and had not been able to put an imaginative attachment to it. This time, the eye took shape, with the opposing bump looking like the over eye shape for his other side of his head. The final shaping cue was putting his nose as emerging in the 45 degree angle of the corner in the concrete. I ask that the viewer look at this as if the frog was partially under the surface of the composted mulch and possibly on his way to fully surfacing. The After Take: Found me having a lot of fun showing it to a number of people on our route. It did not take any of them much time at all to join me in the interpretation of the image that presented itself to me. Before showing the photo on the viewing screen on the camera I gave the chosen label for the picture which took out the guess work. Everyone seemed to enjoy this one immensely. Here is hoping you were able to get a smile out of this little exercise in using one's imagination. Wishing you a fine day. Fitting title. A Mulch Frog actually seems like it could be a real animal. It'd be creepy if their eyes were really that large. I'm glad you gave us the name here, I first looked at it without seeing the name and couldn't make it out. Then after I saw the name I looked at it again and it presented itself. Fun picture! I am having some truoble with this one. Is the black part they eye and head area?